A new Reuters report finds that, "The kingdom appears emboldened by Washington's willingness under Donald Trump to de-emphasize rights issues when it comes to its allies." However, as Elijah Magnier explains, the Saudis have been mocking the world for quite some time, showing that Western values can be purchased by the highest bidder. The leaders of Saudi Arabia mock western values with supreme confidence by virtue of their money power. Democracy, human rights, freedom of speech, freedom to protest, freedom of expression, and other freedoms are treated as norms imposed by the West. If you wish to violate these sacred principles, all you have to do is pay! Leveraging its economic power based on oil, Saudi Arabia defied President Obama when Congress approved JASTA (the Justice Against Sponsors of Terrorism Act) in 2016 and threatened to pull hundreds of billions of dollars out of the USA if Saudi Arabia were accused of playing a role in the Al-Qaeda terrorist attack of September 11, 2001 (9/11). It is known that Osama Bassnan, whom the declassified 28 pages of the 9/11 Commission Report identified as a financial supporter of two of the 9/11 hijackers in San Diego, received money from Prince Bandar Bin Sultan, the Saudi ambassador to Washington, and Bassnan’s wife also got money from Bandar’s wife. The monarchy also defied the UN when in September 2017 a small group of Western nations sought to create a commission of inquiry to investigate its human rights violations in Yemen, one of the poorest countries in the Middle East where millions face death, disease and famine because of western-supported Saudi bombing. And last but not least, a Saudi state media account, which promotes the Saudi Information Ministry’s propaganda and is often retweeted by the ministry, last week appeared to explicitly threaten a 9/11 style attack featuring a plane headed towards a skyscraper in Toronto, Canada. The tweet was a response to the Canadian Foreign Ministry’s tweet, expressing grave concern about recent arrests in Saudi civil society and official attacks on women’s rights activists. Saudi leaders have advocated regime change in Iran (the same Twitter account called for the death of the Supreme Leader of Iran earlier that day), held a Lebanese Prime Minister hostage(the French president intervened to obtain his release), and are bombing Yemen daily as the world looks impotently on, killing thousands of civilians and destroying a country whose only crime is to refuse to submit to Saudi rule and Wahhabi ideology. The world looks on these Saudi abuses with impotent eyes. 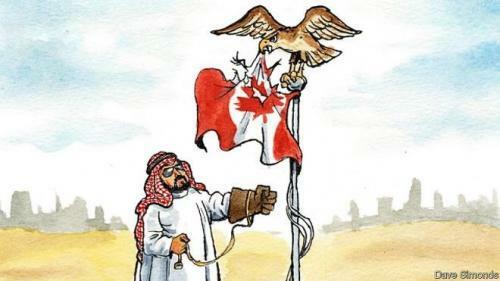 Canada urged Saudi Arabia to immediately release all peaceful human rights activists. 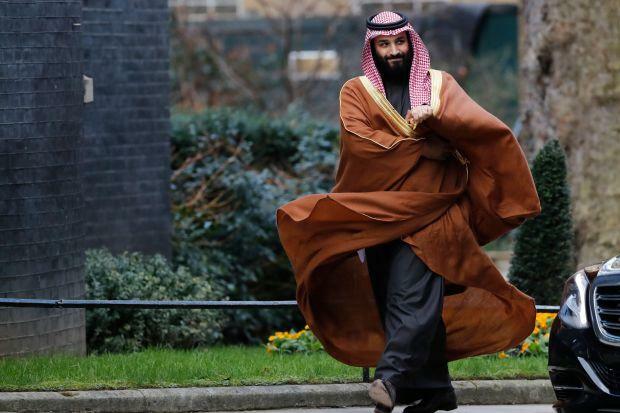 The rough detention of critics has characterized the rule of the young Crown Prince Mohammad Bin Salman (MBS). His first victims were royal family members and the Lebanese Prime Minister Saad Hariri, all held hostage in and by the Kingdom. Bin Salman seeks to repress any voice contradicting him in his oil-rich monarchy; he has already inherited absolute power from his ailing father the King. Crown Prince Mohammad Bin Salman has tried – with little obvious success, despite the support from Western media – to portray the kingdom as a country undertaking reform. But he has not been able to put a modern face on the extremist Wahhabist doctrine, Saudi Arabia’s official religion. This doctrine is the “main source of global terrorism” and the same teaching followed by groups like al-Qaeda and the “Islamic State” (ISIS). These groups share Takfiri ideology with most of the kingdom’s inhabitants. This teaching is notable for its rigidity, intolerance and willingness to kill infidels, whether defined as followers of other religions, secular people, or even Muslims who do not agree with a return to the practice of Islam by the sword. On these terms, Saudi Arabia – duly paying a protection fee to Trump – has a free hand to destroy Yemen, the poorest country in the Middle East, and to kill as many civilians as its jets can reach. Many more are starved or killed by disease thanks to Saudi destruction of the country’s infrastructure. Furthermore, Saudi Arabia has threatened to stop all financial contributions to the United Nations if it is accused of human rights violations. No impartial observer can fail to notice that Saudi Arabian money today leads the great power nations around by the nose. The much-vaunted western values are evidently for sale at the bazaar. Indeed, the world’s silent attitude – which includes Canada – towards the horrible human calamity of the Saudi daily bombing of Yemen, and the support it provides to terrorists (i.e. al-Qaeda in Syria and the Yemen, and ISIS in Syria) boost the Saudi confidence to mock western values with impunity. Evidently western leaders are largely concerned with selling more weapons and signing commercial and trade contracts with oil-rich countries. No wonder the propaganda of groups like al-Qaeda and ISIS finds robust grounds from which to criticize the “Western hypocrisy”, with the theft of Muslim countries’ wealth, and its selective values and principles. Because Tehran escapes the orbit of Trump’s dominance, the new bully in Washington and his warmongering staff had no difficulty revoking an official document (the JCPOA Iran nuclear deal) signed by Obama and world leaders. Iranians are a people with a special aptitude for negotiation at all levels (there is a huge and astonishing bazaar in the heart of their capital). Iranian leaders might have been better “buying off Trump”, as Mohammad Bin Salman did, to purchase their place in the Middle East. Of course, the amount required would have had to surpass the sum paid by the Saudi Prince, Mohammad Bin Salman. The official account linked to Saudi’s Ministry of Information (@Infographic_ksa), with over 300K followers, has been self-suspended to allow the storm of reaction to its threat to pass. Neither Twitter nor Canada commented on the direct threat, much less did they condemn it or ask those responsible to face criminal charges arising from the content. The US-Saudi anti-terrorism center established in the kingdom had no reaction; the Information Ministry simply stated that it has asked its handler to interrupt the account while awaiting further investigation. Saudi accounts attacked the Canadian Foreign Ministry over indigenous women missing and murdered in Canada, reciprocating what they consider an intrusion into their own internal affairs. These Saudis cannot understand that the Canadian government actually accepts this criticism and condemns such abuses. Supporters of the Saudi monarchy evidently find it hard to understand that a western government can accept such criticism. Advocates for human rights are well received in the West, while in the Saudi kingdom such criticism is not allowed and is punished by long years in jail. To say the least, no public beheading is performed in Canadian cities as is normal practice in Saudi Arabia, a practice that ISIS and al-Qaeda are also proud to exercise in their zones of influence. The Saudi escalation (recalling its ambassador and asking the Canadian ambassador to leave; suspending all flights to and from Canada; recalling thousands of students from Canada and suspending scholarships; freezing commercial and investment collaboration) against Canada is certainly not a coincidence. While Saudi Arabia supplies oil to the Irving refinery in Saint John, New Brunswick, Canada imports only 10% of its oil from Saudi and the two countries have limited commercial exchange (notwithstanding their 2014 arms deal.) According to Bloomberg, Saudi Arabia has invested only $6 billion in Canadian businesses since 2006. This year, according to Statistics Canada, Canada has exported $1.08 Billion in goods to Saudi Arabia and imported $1.5 billion in imports from the kingdom. The level of trade and commerce between the two countries is expendable to Saudi Arabia. Money can buy anything and everybody… except perhaps those of us who insist on pointing out that our values, not for sale in the Saudi bazaar, are binding only on those who cannot or will not pay through the nose. Congratulations to Saudi Arabia for its successful purchase of the leaders of the free world.